Wadjet Eye has a knack for producing solid point-and-click adventure games: the Blackwell games, Primordia, A Golden Wake, and many more. So even though there must be a million post-apocalyptic video games nowadays, I trust that they can put a new spin on it. 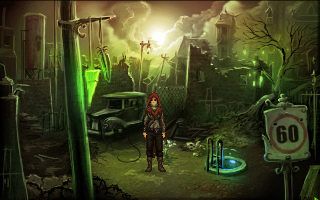 Shardlight's setting sounds familiar enough: "The world ended on the day the bombs fell. Since then, it's always been like this: disease, hunger, death." There's an oligarchy called the Aristrocrats that controls the planet's resources, which is particularly important—aside from food and water the citizens also need vaccinations for a particularly prevalent plague. The protagonist, Amy Wellard, has symptoms, and is working for the government (reluctantly, the description points out) so that she can qualify for the vaccine lottery. However, she believes there to be a cure to the plague, and her adventure to find it is the basis for the game—a more interesting premise than the usual post-apocalyptic man with gun scenarios. As is Wadjet's way, the art is pretty great too, so I've included some screenshots below. Shardlight is due out in spring 2016.